Four gang driven belts, driven by one 7 1/2 hp motor. Uses 3" x 132" belts. ADVANTAGE: Can set up with 4 different grit belts. Belts oriented vertically to minimize floor space. Spring-loaded idler heads with belt tracking adjustment. Dual-drive shaft design to allow for quick belt replacement and easy open guard doors. Can be moved easily with hoist on grab ring or for lift. Standard belt speed of 4000 fpm: others available. 100" overall height, 68" overall width, and 39" overall depth. 44" from floor to center of contact wheel. On-machine dresser to true the contact wheels. Each grouping of 2 belts can run at different speeds. Custom spacing of belts, belt width and belt length. Adjustable feet available with 6" of travel. 110 or 277 VAC fluorescent light. Harder or softer contact wheels. Twin belt sander/polisher also available. The Quad Belt sander/polisher is simply the best value for the money. It offers productive and flexible operational features not found on any other machine. Its 4 belts make any job eastier and more efficient. There are many options to accommodate each user's preferences. 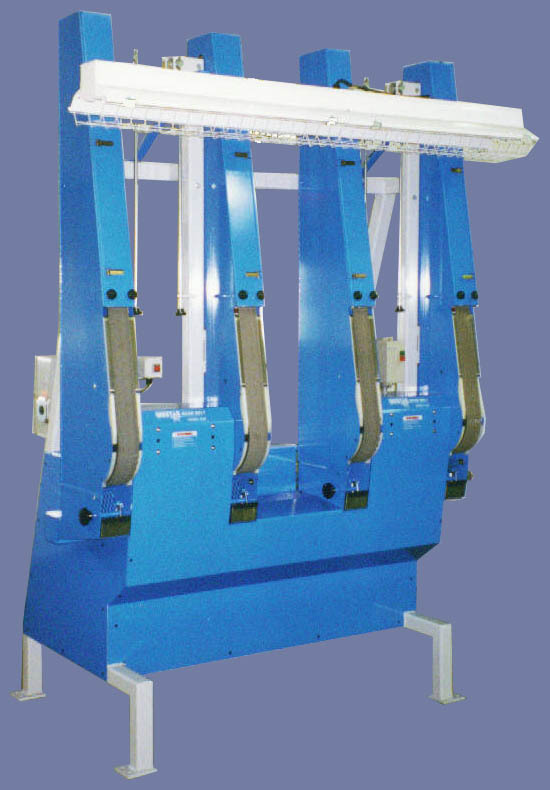 The Quad Belt sander/polisher will allow you to finish a quality product quickly.